Mother's Day will become an even happier affair when this vibrant gift tower arrives! 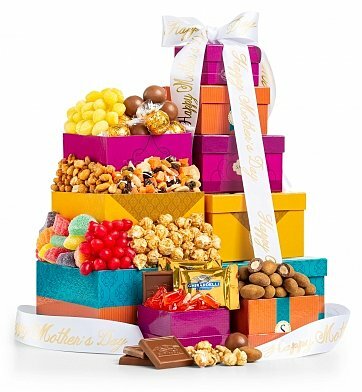 Filled to the brim with juicy peach candies, chocolate squares, truffles and more, this colorful tower is perfect for Mom and is sure to be remembered! The tower arrives with a white satin ribbon bearing the message "Happy Mother's Day". LINDOR Milk Chocolate Truffles, Ghirardelli Squares. Cinnamon Almonds, Peach Hard Candies. Caramel Toffee Popcorn and more. What else is in this gift tower? Each gourmet item is carefully assembled by hand, and the tower is accentuated with a hand-tied satin Happy Mother's Day ribbon. Complimentary scissors are included so your recipient can easily open their gift, as well as a free card with your personal message or greeting. Your gift will leave a lasting impression as the recipient repurposes these five exclusively designed boxes, stacked together to make a unique tower. if ordered by 5:00 pm EDT Tuesday April 23rd. For delayed delivery, GiftTree can hold your gift and have it shipped to arrive anytime. To use this option, select "Ship Later" on the next page. Sweet Delight Mother's Day Tower is a hand delivered gift. These gifts are delivered by one of our local design centers located throughout the United States and Canada. Same day delivery is available for most gifts when ordered before the cutoff time. The cutoff time for Sweet Delight Mother's Day Tower is 2 PM in the recipient's time zone. Butterfield's Peach BudsButterfield's peachy, juicy hard candy bites taste fresh from the orchard and have been disappearing from candy jars since 1924. Old Fashioned Lemon DropsOld fashioned hard candy lemon drops are all natural and made with real lemon juice. Chocolates from Ghirardelli and Lindt, Caramel Popcorn and more. Five colorful gift boxes with Happy Mother's Day satin ribbon. Includes a free card with your personal message or greeting. Easily Send to Multiple Locations on the Next Page.